SKYCAP-46 Key Features: (1) 46-Liter capacity; (2) Stowable shoulder straps and waist belt; (3) 15” laptop support plus admin front pocket; (4) Large volume main compartment with external compression straps; (5) Blend of 1000-D and 500-D CORDURA for great strength to weight ratio. The 2018 SKYCAP-46 is a carry-on compatible* duffel backpack designed for world-travelers like you. Dedicated laptop / tablet compartments for quick access at the airport, multiple lockable zippers, a RFID-blocking pocket, and dozens of pockets / slots. This fully padded 46-liter duffel backpack is THE solution for you to travel securely with all your essentials. Dual top and bottom zippered stash pockets can hold our Maximizer organizers, and provide quick storage on the go. Front compression straps and bottom lashing points let you carry lightweight travel gear (e.g. pillow, jacket, shoes) without taking up internal space. The compression straps have dedicated tuck-away pockets when not in use. A front pocket is large enough to store documents for quick access, or to store a phone, wallet, belt and keys before going through airport security. The side panels are padded with dense EVA foam, ensuring your valuables (cameras & lenses) are protected. With three grab handles (top, side, bottom), overhead storage is made easy. The side handle also doubles as a luggage handle pass-through for easy carrying and navigation. There are three external loop fields your ID patches / badges to quickly identify of your SKYCAP. The laptop / tablet / admin pocket lets you store your 15” laptop and a full-size tablet in their own dedicated quick access padded sleeves. The pocket also has an admin organizational panel for your chargers, pens, headphones, and wallet. There’s also a RFID-blocking pocket to protect your passport and credit cards from digital pickpockets. The main compartment is lined with high-viz orange 210-D ripstop nylon, offering generous storage for your clothing and travel essentials. The front zippered ToughMesh pocket is perfect for a toiletry kit, or one of our Maximizer organizers. Two side ToughMesh pockets are for larger items (sandals, shoes) or dirty clothes. Ergonomic shoulder straps (EVA foam) can be stored in a low-profile YKK zippered compartment, converting SKYCAP backpack to a duffel bag. This same back compartment also stores a padded waist belt to help you carrying a heavier load. For the best balance of weight and strength, we use ultra-durable 1000-D Cordura® nylon at high-wear areas (bottom, sides), and 500-D Cordura® for the rest of the bag. Our Cordura® is treated with DWR (Durable Water Repellent) for all-weather performance, and will be ready every time you need it. *Size limits vary with each airline. Please check the carry-on size with the airlines you are flying with before your trip. Padded main compartment to protect your personal items. This is the review I left on Amazon. I'll just copy /paste it below. Could not be happier with this purchase. And I'm not a shill. Look me up. But when I like something I'll tell you. Congrats, Vanqest. Well done. I travel for work on average of nights a week and this is my new weekly travel bag. It is extremely well thought out with pockets and access in all the right places. Vanquest makes great products and have been very happy with it the last 4 months I've owned it. My new full time travel bag. In the past I would go through all my bags to find the one that fit the situation best but now I have Skycap-46. It holds all I need for travel and has room to spare. The admin section is awesome and held my 13 inch MacBook Pro and my iPad with all the odds and ends needed in there. Some of the other organizational pockets on the outside hold all of my charging cords. I overpacked on purpose to see how it would handle it and it did great. I even had an extra pair of shoes that were size 14 and still had some extra room. The shoulder straps are comfortable and the belt works well (I don’t use it but it tucks away nicely). The grab handles are great and very comfortable. Unfortunately I was not able to take it on a plane trip yet and that is where I was really wanting to test this bag. I want to see if this can be my take everything I need and not have to check a bag bag. My trip was postponed so I will have to wait on plane travel but I can honestly say I love this bag. The build quality, the design, and as usual the customer centered service with Vanquest is top notch. It's like having all the benefits of a backpack + all the benefits of a duffle in one bag! This fits everything I need and more. If you're traveling light you can easily tighten the compression straps for a thinner profile. Vanquest thought of everything on this one. Even when everything is packed to the max and closed up they still make your necessities incredibly accessible. This is my new favorite bag! Using as EDC for teaching/gym/literally anything. I preordered this bag after seeing it announced. It resembles Osprey’s porter line, but is much more durable and versatile. The storable straps are great for minimizing the bags profile for travel. My one critique would be that it doesn’t have an easy way to stow a water bottle, and there isn’t any Mille on the exterior to attach the Vanquest water pouch. Still, I can’t wouldnt withhold a star for that, as the bottom pouch can be utilized for they if you don’t need to carry shoes or something else in there. The pouch for a laptop and other administrative gear is great, but be sure to use a close-fitting sleeve as the max laptop size of 15” is indeed a maximum size. My 2017 MacBook Pro fits well, though. I love that the bag cinches down to a much smaller size when yo pack less. The straps and belt are surprisingly comfortable for a convertible bag. Obviously it’s too early to report on durability, but I’m hoping to use this as an EDC to carry workout gear, work supplies, and anything else I need. So far, it’s been a great choice that I can use no matter how much or how little gear I have. I'll be using this bag for the first time on a trip soon. The bag is well thought out and looks to be a winner and a good alternative to the wheeled options. Being soft-sided also means that it is more easily accommodated in overhead bins unlike the wheeled versions. The convenience of being able to store the straps, the front compression area for my travel pillow, and the numerous pockets are appreciated. Construction is top notch and the fabric superb. This along with my Skitch 15 are my new travel buddies. My new goto travel bag! 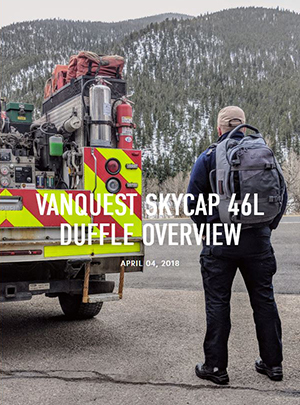 I just received my new Skycap 46 bag from the folks at Vanquest and it completely lives up to the standards of my other Vanquest products. They literally thought of everything when designing this product and it will become my new goto bag for all my travel. The tuck away shoulder straps are going to be unbelievable convenient when traveling with this bag as a carry on. Wear it as a backpack traveling thru the airport then tuck the straps away before you get on the flight so the straps don't get caught in the overhead compartment. The multiple storage pockets and quick access panels are invaluable for a trip and the ability to stuff the bag full with the compression straps will be fully utilized as it seems we always come back home with more than we packed. the quality of the material is second to none and will endure years of heavy use. Package the Skycap 46 with the five star customer service of Vanquest and you simply can't go wrong! Thank you Vanquest for another well designed and executed product! Vanquest Skycap 46: An Airline Flight Luggage Option! !